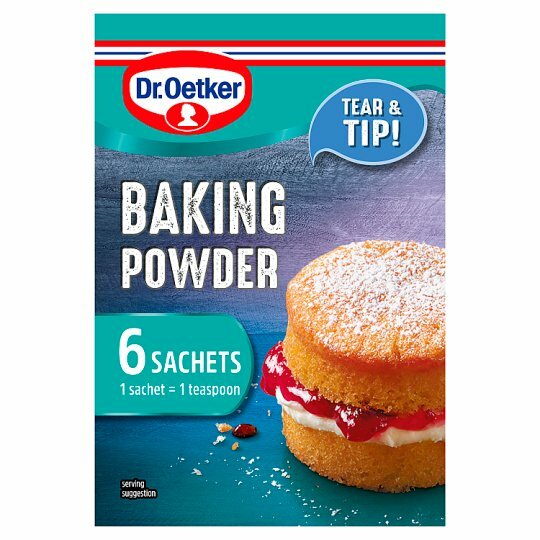 We've created single serving sachets of the Dr. Oetker Baking Powder for added convenience and freshness. 1 sachet equals 1 teaspoon of baking powder. In 1893 in Bielefeld, Germany, Dr. August Oetker developed 'Backin' a superior form of Baking Powder, packed in small sachets. It guaranteed perfect results and became a huge success. Today, we're still a family business, famous for our baking passion and quality products that help you enjoy even better baking. Store in a cool, dry place., Best Before End See seal of sachet. One sachet contains one measured level teaspoon for convenience. Use quantity of Baking Powder as stated in your recipe. Ideal for use in standard and gluten free baking recipes. Individual sealed sachet for freshness.